Do I need to have a termite inspection when living on a top floor of a condo building? Have you or someone you know ever had to deal with termites at your/their home or condo? If you have, then you understand not only how costly it can be, but also how it can turn your life completely upside down for a good amount of time. Termites attack thousands of homes and buildings each year in the United States, and homeowners fork out millions of dollars annually to repair the damage they cause and treat the termite problem itself. And if you think that just because your condo is on the ninth floor of a concrete building that you are exempt from this potential issue, you are sadly mistaken. And as you may have guessed, that is exactly what we are going to be discussing in today’s blog post! What are termites and how can you identify them? Before we get into the meat and potatoes of today’s post, we wanted to give a brief overview of what termites are and how you can possibly detect them. Termites are often referred to as the “silent destroyer” as they do not come out into the open which makes them very difficult to detect at times. In some cases, termites can be secretly thriving and hiding in your home, condo or yard and do not show any immediate signs of the damage that is being done. If you are looking for information on how you can detect these pesky creatures, termites usually have straight, beaded antennae, their wings are equal size, they have uniformed waists and measure approximately 1 cm to a few millimeters in length. Primarily, termites feed on cellulose (which is a part of wood), but they are also known to damage books, insulation, paper and even filtration system and swimming pool liners. Additionally, while there are different types of termites, they all feed on detritus which include dead trees and plants, as well as dead parts of living trees including wood. And unfortunately, regardless of their construction type, all homes have the ability to provide cellulose food which in turn harbors termite infestation. So while you may think this issue may never present itself in your living space, all house foundations, shelves, furniture and even books can draw in termites and provide a cozy place for them to stay and live. 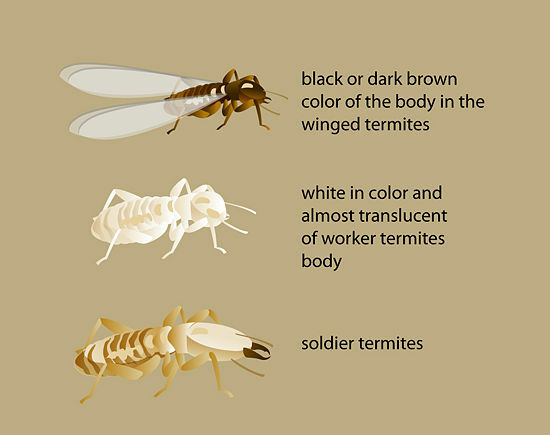 Now, this information is not meant to scare you, but rather provide you with the knowledge and tools to be aware and alert to catch it fast if you see any signs of termites in your home or condo. What types of termite’s attack condos? We may be giving you more information than you originally thought you were looking for, but we figured we would educate you on everything related to termite and condos so you can better understand how everything is related. Subterranean and drywood termites are the two specific types of termites that frequently attack condos. Subterranean termites are known to attack buildings from underground by entering through cracks in concrete slabs or from flowerbeds through tunneling under siding that is close to the soil. On the other hand, while drywood termites do not live in the soil, they tend to attack condo buildings in the spring and summer during their mating flights. They also tend to land on the wooden trim around windows and doors and make their nests in small cracks in wood to start new colonies. Can termite’s travel from one unit to another in a condo building? Now don’t freak out, but the answer is yes. It is no secret the damage termites can do to a single-family home, but when it comes to condos, termites can be downright destructive and can easily travel from one condo unit to the next. Of the two, subterranean termites are the worst because they often enter the building through expansion joints between two slabs, allowing them to easily and swift fully inhabit two or more units at the same time. On the same note, if these subterranean termites were to invade one unit, they can enter the neighboring unit by traveling through the common wall. Due to the fact that these types of termites are able to stay hidden, they tend to cause damage to multiple condo units before they are even discovered or detected by the residents. At the same time, drywood termites are also able to move freely between condo units. You will see this especially if they have inhabited exterior wooden trim, a wooden fence, or a carport, as drywood termites then gain access to the several units that these areas are attached to. Now you may be asking yourself what happens if a unit in a condo building is affected by termites. And, as you can probably tell by now when termites invade condo buildings the exterminating process can prove to be extremely challenging. This is especially true if there are several units in the same building that have termites. Why do I have to pay for a termite inspection, even if my condo is located on the 9th floor of a concert building? 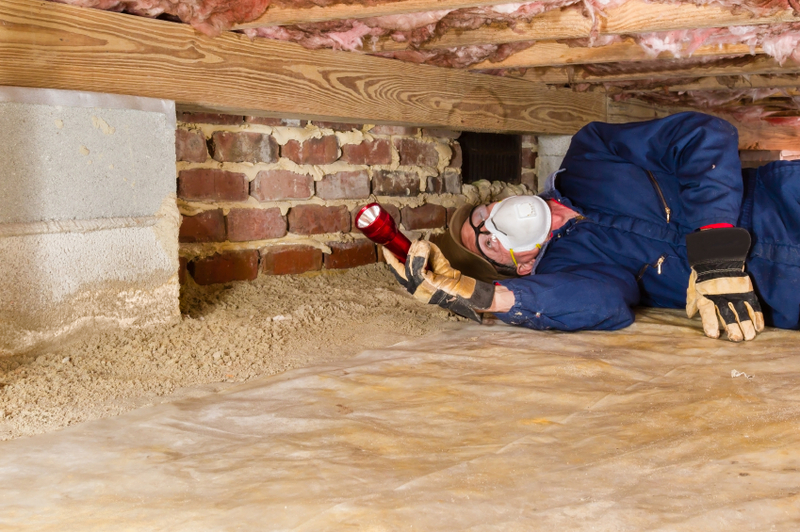 Hopefully, by now we have equipped you enough information for you to understand why you need a termite inspection, even if your condo is located in the upper levels of your condo building. It is always better to be safe than sorry, and just because your building is made from concrete does not dismiss it from the potential of a termite infestation. And as we spoke about earlier, even if the unit does not outwardly show any termite damage, you never know what is going on within the walls and unseen areas of the condo unit. The termites may have spread to your unit from a neighboring unit and you want to bring in a professional so they can assess the situation. Additionally, some pest inspectors will also look for leaks, beetles, mold and water damage within the unit when they come out for the termite inspection. This is a huge bonus as it will give you a better overall picture of the status of the unit, and allow you to fix any potential issue before it gets worse down the line. What should I do if I am looking to buy/sell a condo in Myrtle Beach, SC? If you or someone you know is looking to buy or sell a condo in sunny Myrtle Beach, SC, be sure to give our experienced team here at Jerry Pinkas Real Estate Experts a call today! We have seamlessly helped numerous individuals, couples, families, and retirees through the buying and selling process and we know we can do the same for you. Our real estate team is different from most in our area because we have a separate set of realtors that are solely dedicated to helping and serving our buyer clients and a separate set of realtors that are solely dedicated to helping and serving our seller clients. So you can trust that your Jerry Pinkas real estate agent will not be educated and well versed in the buying or selling process, but also that they will work hard in your best interests. We know you have your choice of realtors in the Myrtle Beach, SC area, but why have average when you can have the best? Allow our dedicated team of agents to serve you today. We look forward to hearing from you and working with you soon!